A pair of hot dog billboards is raising some eyebrows near Boston Logan Airport. It's not an advertisement for the popular food, but rather they are calling on local hospitals to stop serving them. A local public health group is making the menu request, citing certain health hazards of hot dogs. The two newest billboards in Boston are raising some eyebrows. Alongside an image of a young girl in a hospital holding a hot dog, the billboards near Logan Airport ask the question: "Choking risk now, cancer risk later?" The message? "Ask your local hospital to protect patients from #Hazardous HotDogs!" The Physicians Committee for Responsible Medicine, a non-profit comprised of 12,000 doctors who advocate for a plant-based diet, is the group behind the billboards. "I think it's really important that we get children eating healthy and it's hard to correct your eating habits when you get older," said committee member Dr. Marge Peppercorn. The group is now targeting Boston Children's Hospital for serving hot dogs to patients. "Why should you give them something you know is carcinogenic and harmful?" asked Peppercorn. "You wouldn't be giving them poison. Years ago people thought cigarettes were okay and people felt comforted if people had a cigarette. They don't give cigarettes to people in the hospital because they know it's a carcinogenic." On Wednesday, they sent a complaint to Boston's Public Health Commission citing the choking risk of hot dogs and health issues that come with eating processed meats. "We appreciate the Physicians Committee for Responsible Medicine reaching out to the Boston Public Health Commission regarding the important issue of nutrition in Boston’s hospitals," said Robert Goldstein, BPHC's director of communications. "BPHC has a long history of working with our hospital and healthcare partners to improve healthy options, reduce sugar-sweetened beverage consumption, and create healthy, smoke-free campus environments." This year, the American Medical Association modified their suggested food and nutrition policy, calling on hospitals to stop serving processed meats. 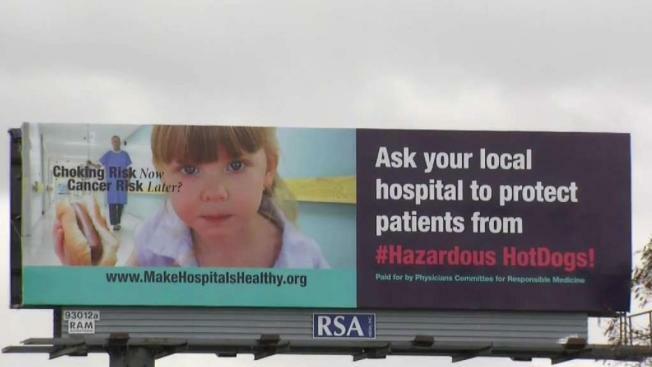 The billboards will be up for two more weeks, and the Physicians Committee is asking for the health commission to take action by March.